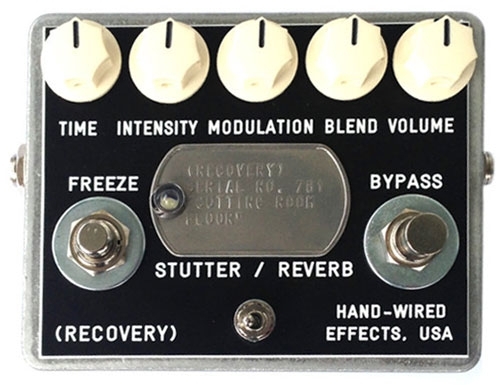 (Recovery) Hand Wired Effects is the blood, sweat and tears of Graig Markel who produces hand-crafted, ultra specific tones for our enjoyment. Take a look around his site and you will find effects that dig deeper than the typical call of ‘distortion’ or ‘delay.’ Instead you’ll find pedals like the Bad Comrade that ,”pitch, glitch, slice and dice.’ Or the The Grizzled Mighty that provides, ‘ultimate low-end fuzz.’ These are pedals that, like their creator, don’t mess around. And now, his company is on Pedal Finder. Pushing his products out of Seattle, Graig has lots of admirers including Lee Reynaldo from Sonic Youth, Jim Eno from Spoon Kristen Hersh from Throwing Muses and one of my favorite artists –the prolific John Vanderslice. But, he’s not only a builder of effects, but a musician and producer as well, putting his designs to work for others and getting behind the microphone himself. He’s done solo work and partnered with others in Dead Ship Sailing and The Animals At Night – all of which can be found at www.graigmarkelmusic.com. If you haven’t checked out his wares — its worth the time. And head over to his custom page to see what kinds of one-offs and limited editions he has going on. Then go to Pedal Finder and leave a review on anything you’ve been fortunate enough to sample or own!